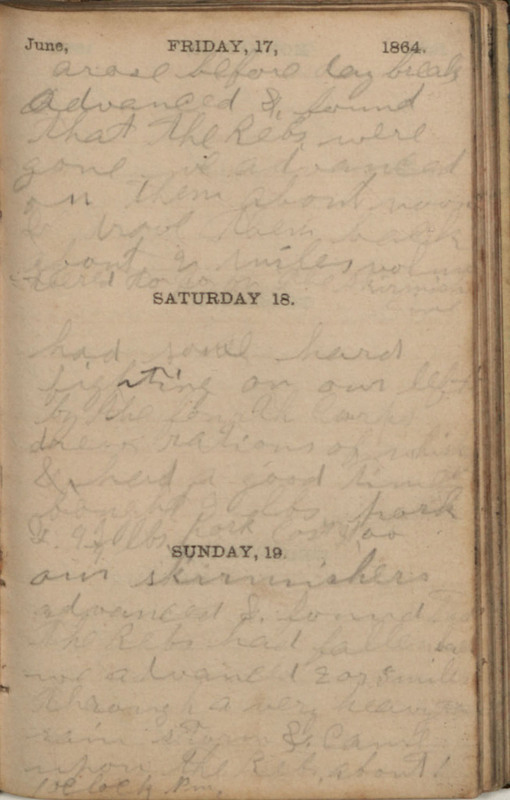 June, FRIDAY, 17, 1864. arose before day break Advanced &, found that the Rebs were gone we advanced on them about noon & drove them back about 2 miles volunteered to go on the skirmish line SATURDAY 18. had some hard fighting on our left by the fourth Corps drew rations of whisky & had a good time bought 9 lbs pork &. 9 3/4 lbs. pork Cost $1.00 SUNDAY, 19. our skirmishers advanced &. found that the Rebs had fallen back we advanced 2 or 3 miles through a very heavy rain storm & Came upon the Rebs about 1 oClock Pm.